Home New York Yankees New York Yankees: Is Gleyber Torres Next Up? In spring training, the young New York Yankee players, Miguel Andujar, Gleyber Torres and Tyler Wade competed with veterans, Ronald Torreyes, Brandon Drury and Neil Walker for spots on the infield. The Yankees had the kids, Torres and Andujar, at second base and third base respectively during spring training, and neither was able to win a starting role due to their underwhelming performances, particularly at the plate. Although Torres’ struggles at the plate may have been due to the long lay off from the elbow injury he suffered in June, followed by Tommy John surgery, service issues as well appeared to dictate that he begin the season at Triple-A Scranton Wilkes-Barre. Wade and Walker were slated to platoon at second base. Andujar was sent down as well in favor of Drury and his experience at the hot corner. Then came the spate of injuries—Greg Bird with bone spur surgery on his ankle and Drury with migraines and blurred vision—and the best laid plans of spring training for the infield were disrupted. Instead of Wade and Walker platooning at second base, it is now Walker and Tyler Austin platooning at first base. Wade has struggled in a full-time role and has hit .094/.171/.156 in 11 games at second base. He has struggled so much, that utility infielder Ronald Torreyes, currently batting .429/.429/.500, started at second base on Friday night in Detroit. Though one might note that Wade has been the victim of the flu in the past week or so, he has also not produced when healthy. With the Drury illness, Andujar has been recalled from Triple-A to hold down third base; however, in eight games with the Yankees this season, Andujar is hitting just .156/.176/.250. With Neil Walker also struggling at the plate, batting .188/.264./208 and sharing first base duties with Austin, who is batting .265/.359/.500 in 10 games, the Yankee infield (including Didi Gregorius, who is having a stellar start to the season batting .311) is batting a collective .240. 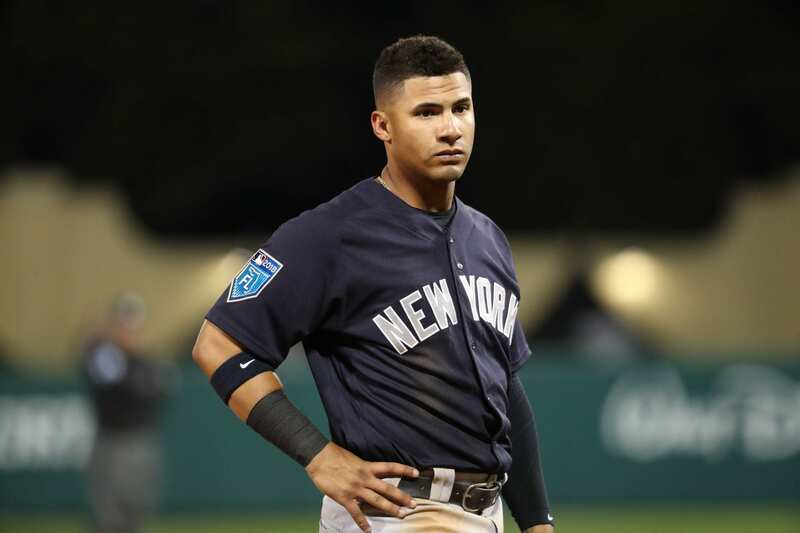 Illness, injury and early season struggles for Drury, Wade, Walker and Andujar have left fans calling for the Yankees to bring up Gleyber Torres. In eight games in Triple-A this season, Torres is scalding the ball, hitting .387/.412/.548 in 31 at-bats. In the field with Scranton, Torres has split time between second and third base. If the Yankees wait until after April 18 to call Torres up to the big leagues, then they get another year of control regarding free agency. The question is where are the Yankees now as far as the infield is concerned? Is it a short-term situation, as Boone suggests, in which Drury can be expected to return sooner rather than later, Wade can be expected to begin hitting, and Walker can once again be effective at the plate? Or is Torres, the number one prospect in the Yankee organization, ready to bring his elite skills to the big leagues and solve one of the Yankees pressing needs at second or third base? It will be interesting to see which path the Yankees take after April 18 when Torres is able to come up to the big club. Will Yankee fans see Torres in his big league debut in the near future? They don’t like bringing AAA guys up during hot streak, can be deflating, unless absolutely necessary. Probably May at best. Again, nothing is etched in stone.